We studied the effects of DMSO and fibroblasts during HepaRG cell spheroid formation and conditions of their subsequent culturing on the levels of mRNA of the major cytochromes P450. A protocol of spheroid formation from differentiated HepaRG cells and their culturing in serum- and DMSO-free medium is developed. V. V. Galatenko, M. Y. Shkurnikov, T. R. Samatov, A. V., Galatenko I. A. Mityakina, A. D. Kaprin, U. Schumacher, and A. G. Tonevitsky, Highly informative marker sets consisting of genes with low individual degree of differential expression. Sci. Rep., 5, 14967, doi: 10.1038/srep14967 (2015). 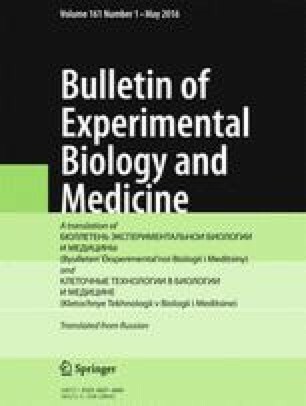 D. V. Maltseva, N. A. Khaustova, N. N. Fedotov, E. O. Matveeva, A. E. Lebedev, M. U. Shkurnikov, V. V. Galatenko, U. Schumacher, and A. G. Tonevitsky, High-throughput identification of reference genes for research and clinical RT-qPCR analysis of breast cancer samples. J. Clin. Bioinforma, 3, No. 1, 13, doi: 10.1186/2043-9113-3-13 (2013). Y. Sakai, M. Koike, H. Hasegawa, K. Yamanouchi, A. Soyama, M. Takatsuki, T. Kuroki, K. Ohashi, T. Okano, and S. Eguchi, Rapid fabricating technique for multi-layered human hepatic cell sheets by forceful contraction of the fibroblast monolayer. PLoS One, 8, No. 7, doi: 10.1371/journal.pone.0070970 (2013). T. R. Samatov, A. G. Tonevitsky, and U. Schumacher, Epithelialmesenchymal transition: focus on metastatic cascade, alternative splicing, non-coding RNAs and modulating compounds. Mol. Cancer, 12, No. 1, 107, doi: 10.1186/1476-4598-12-107 (2013). Y. Takahashi, Y. Hori, T. Yamamoto, T. Urashima, Y. Ohara, and H. Tanaka, 3D spheroid cultures improve the metabolic gene expression profiles of HepaRG cells. Biosci. Rep., 35, No. 3, pii: e00208, doi: 10.1042/BSR20150034 (2015). C. C. Wang, S. Y. Lin, Y. H. Lai, Y. J. Liu, Y. L. Hsu, and J. J. Chen, Dimethyl sulfoxide promotes the multiple functions of the tumor suppressor HLJ1 through activator protein-1 activation in ells. PLoS One, 7, No. 4, doi: 10.1371/journal.pone.0033772 (2012).